Netanyahu’s promise to provide a ‘new and conclusive proof of a secret nuclear weapons program that Iran has been hiding for years from the international community in its secret atomic archive” proved to be nothing more than a rehash of outdated, useless talking points. 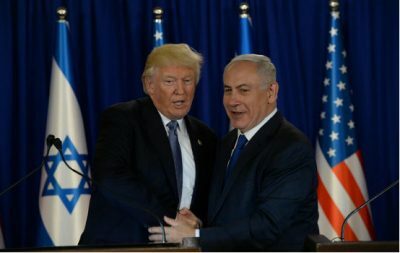 While Trump’s long anticipated declaration relied heavily on scare tactics, bombast and a barrage of belligerent, unverified accusations citing ‘new evidence’ presented at Netanyahu’s flim-flam event, Trump failed to provide one iota of evidence that Iran had not been in compliance with the Agreement. Trump failed to explain how attempts to improve the Agreement had failed and totally missed the irony when he dutifully parroted that Iran’s ‘regime has funded a long reign of chaos and terror by plundering the wealth of its own people”as if America’s history of spreading global chaos and terror remains a Deep State secret. Within hours of Trump’s green light, Israel initiated a massive bombing attack on Iranian positions in Syria, according to Haaretz, firing from Israeli positions in the disputed Golan Heights in southwest Syria. The GH, which is within missile range of Damascus, has been occupied by Israel since the Six Day War in 1967 and remains internationally recognized as Syrian territory. The IDF (Israeli Defense Forces) reported that its Iron Dome missile defense system was deployed and intercepted some twenty incoming projectiles in what may have been an unprecedented return volley from Syria which Israel labelled as an ‘act of aggression”. The Iron Dome system was built for Israel by the American weapons manufacturer Raytheon and with Congress funding the system, courtesy of $705 Million from the American taxpayer. Renee Parsons has been a member of the ACLU’s Florida State Board of Directors and president of the ACLU Treasure Coast Chapter. She has been an elected public official in Colorado, an environmental lobbyist and staff member of the US House of Representatives in Washington DC. She can be found on Twitter @reneedove31. Featured image is from Israeli Ministry of Foreign Affairs/Flickr.